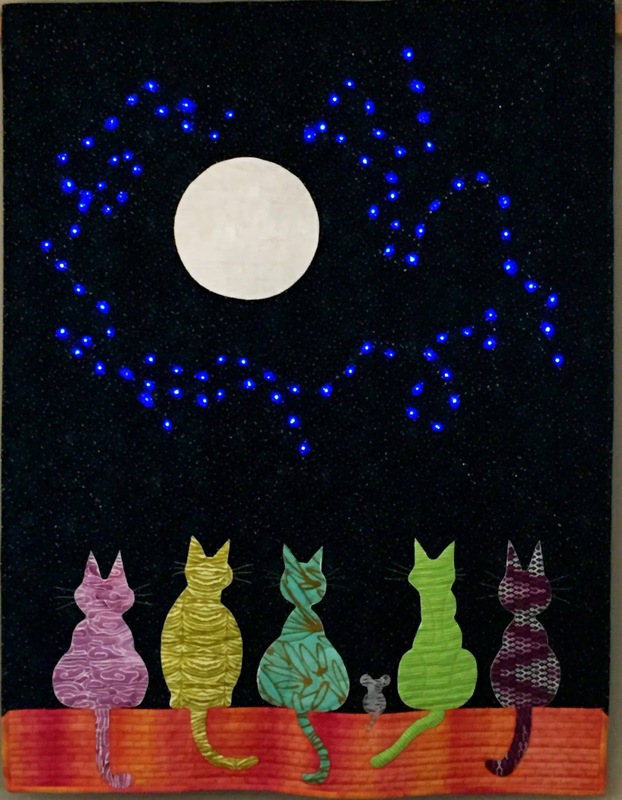 This is part six of the blogs about making my "Once in a Blue Moon" quilt. It covers the embroidery and beading. I picked out embroidery floss that matched the colors of the cats and embroidered the whiskers on the cats. Where the cat appears to be facing right or left, I lengthened the whiskers on the facing side and shortened them on the back side (of the head of the cat). My beads are mostly seed beads and a few crystals that I already had. I pulled out my drawing of the constellations and added a few of the crystals where I wanted the viewer to be able to identify them. Then I added beads willy nilly to give the quilt some sparkle. They are barely noticeable. Should have done hot fix crystals. This quilt took quite a bit of time to make and lots of thinking through the process of the LED lights. That is so good for my brain, and would be for yours too, to try something new. It keeps the neurons firing and connected so that as I keep aging, I don't loose my capability to think. (I know that is not even close to any of the technical terms, but you get my drift). Step outside your box, push yourself to be a little uncomfortable, try something new, make new friends, see new places, be inspired by art..... it's all good. Don't you think so too? I enjoyed reading all about your process in getting to the finish with this project. It is the cat's meow for sure! :) I agree with you about working er thinking outside your box. I too believes it keeps our various "parts" in top notch working order!